Back in the 1990s, they used to say that black backgrounds were for Web sites that wanted to be “cool.” But that’s not why I did it (and I haven’t been cool since at least 1994); these pages are black because I’ve found that it’s easier to read light text on dark screens than it is to read dark text on light screens! When it comes to paper ephemera, the opposite tends to be true — black text printed on a white piece of paper is easier to read than white text on black-printed paper. It’s also cheaper — with the old paper publishing, black = ink = money. But the display screens we use with computers today are different from printed paper in this and many other ways. On printed paper, it’s easier to read a typeface that has serifs, which are the gilded edges of the main strokes of the characters. (Times Roman is the classic serifed font.) This is why newsprint is always in a serifed font — newspapers must be designed for readability. It so happens that with the CRT display screens used with computers (and televisions and teletypes), a sans serif font — such as “Helvetica” or “Ariel” — tends to be easier to read. That some studies found this to be true does not mean that these should be the standard preferences for all etext; nor it does it mean that Web publishers (myself included) should force their personal font and color preferences on their readers — unlike books and other printed matter, there is no price penalty for choice of color or font, or for changing them post-publication. And it’s a terrible shame that, with more than a half-decade of Netscape Navigator behind us (and that’s in real, not Internet years), there are only a handful of workable, actively developed Web browsers to choose from and none of them are really optimized for reading text. I think that’s why they still call them Web “browsers” — nobody’s ever made a Web reader. My current favorite all-around combination is what I’m using on this site, which is bluish-white text (#CCCCFF) on a black background (#000000). There are plenty of other combinations that work. White text on blue is good — so good that the designers of WordPerfect and of the Apple IIgs both picked it as their default. I also like black text on a bluish-white background, which I used in my music-review zine Review Addict . I tend to cycle the colors I use on my personal start-page; right now, it’s black text on an aqua/turquoise background (#CCEEEE). I used to like to read text-only Citadel BBSes with either red or Navy blue text on a white background, and I still favor the Navy blue-on-white — this is the scheme I used for linart, a resource for artists who use Linux. The standby of black text on white background is used by a lot of top etext designers — most notably by Philip Greenspun — and a lot of people still prefer it. Until recently, my emacs text editor was still (un)configured so that most buffers used those colors. However, I want to get away from this default and the “HTML files are pages, like pieces of paper” kind of thinking — and its limiting of the possibilities — that it tends to encourage. Because reading text with the computer is unbounded — the possibilities are wide open, waiting for you to think them up. Or as Paul Muter wrote: “At present , we do not know how to optimize reading via electronic equipment.” That we still call variable-length files displayed on these screens “pages” shows that we still have a long way to go in making these distinctions. Dr. Lauren Scharff is one of the relatively few people actively researching the readability of graphical user interfaces. Her conclusion so far (in the Netscape/IE world of late-1990s “browsers”) is that there’s no easy answer for Web site readability. But I think that we’ll see the preferences soon turning toward the reader, and letting the reader choose the fonts and colors dynamically and on-the-fly, and easily, so that this “page” may be black — or white, or red, or green — depending on how you, the reader, feel it should be. Table of screen colors with UNIX names, hex color codes and sample text. 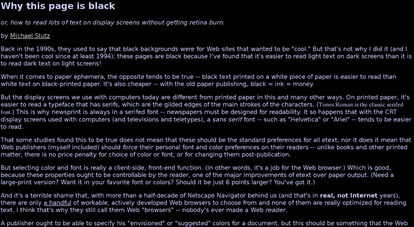 Dan Lyke’s rant on black-on-white screen text (on a black-on-white page itself! ), is worth reading. First published on March 2nd, 2009 at 4:06 pm (EST) and last modified on June 9th, 2010 at 2:55 pm (EST).